Welcome to the WildBlue weekly eZine, the latest development in our process of building a dynamic and interactive community at WildBlue. The eZine keeps readers up to date on developments at WBP and even puts their voices at the center of the conversation with our “Ask A Detective” and “Ask An Author” series. The eZine gives subscribers exclusive and early access to new blog content, contests and events such as author-hosted book club meetings. Series such as “True Crime 101,” explore crime stats, breakthroughs in laboratory science, criminal psychology and more through illuminating graphics, videos and anecdotes from the field. Beginning in May, the eZine will be available only to those subscribed to our email list. Don’t forget to sign up here. “It’s a real life murder mystery with some real sick twists and turns,” said Barer who had no trouble tricking…uh…convincing Girardot into joining him behind the word processor for a new true crime venture. The two men took time out of their busy schedule of consuming massive amounts of coffee at Starbucks to share a portion of the recently written prologue to their soon to be published collaboration. Click here to read the prologue! WildBlue Press authors Caitlin Rother and Steve Jackson will be organizing more writing workshops across the country in the near future. We will keep you posted as more opportunities arise! NO STONE UNTURNED by Steve Jackson will be released April 28th. Pre-order today! 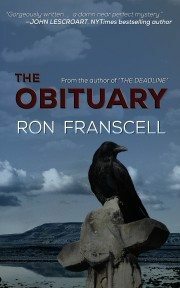 THE OBITUARY by Ron Franscell will be released May 15th. Pre-order today! 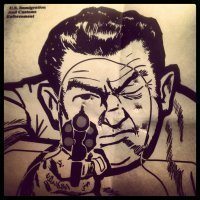 DIXIE’S LAST STAND: Was It Murder Or Self-Defense? by John Ferak in print now. VAMPIRE: The Richard Chase Murders by Kevin Sullivan. Look for it later this month. This week’s featured author is Kevin Sullivan, author of WildBlue Press original VAMPIRE and upcoming release, KENTUCKY BLOODBATH. 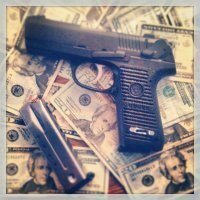 “If you’re reading this blog, I assume you know me, and if that’s true, then I don’t have to tell you I write true crime – books, articles, and blogs – with a bit of history thrown in for good measure. But what you probably don’t know is that I’m an ordained Christian minister with over 30 years’ experience. If you’re thinking that sounds a bit strange, well, you’re not alone. After all, many believe, the world of crime, murder, and mayhem, are worlds apart from the world of ministry. But are they really all that different? Years ago, when I was still a young minister, I came to the conclusion that cops (and their world of crime and endless trouble) and ministers aren’t all that different; at least not in certain aspects of the jobs we perform. Police are first responders, and are witnesses to all manner of terrible human acts; and if they’re lucky, they can save some lives along the way. Ministers, on the other hand, are often second responders, performing very particular jobs helping folks recover from these horrific events, and as such, often see (like cops) many situations hidden from the public-at-large. of children, to ministering to the dying and preparing them for the journey to the next world. I have dealt with killers, grieving parents, patched up marriages, visited the sick, ministered to the oppressed, all the while helping people to become stronger, happier, and wiser individuals. It’s all a part of what we ministers do. Believe me, writing true crime and history is a breeze compared to the ministry.” This excerpt is part of a longer story that you can read on the WildBlue Press blog. This week’s giveaway: a WBP true crime audio book! Why do you read crime books, and what makes a story compelling to you? The first nine people to email an answer to [email protected] will receive an audio book from one of our bestsellers! Thought provoking answers may appear in next week’s Roundup! Check the WildBlue Press site and eZine for the Fans Choose Giveaway. Coming Soon: KENTUCKY BLOODBATH cover competition. Fans vote for the best cover and are entered in a drawing for a WBP prize! Find more of what you’re looking for on our blog page. This month we are asking you to write in and let us know why you read crime books. See our Contests and Giveaways section below to get in on the action. 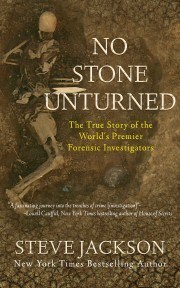 1.Author Steve Jackson will be hosting a live online Q&A event on Monday May 11th to discuss NO STONE UNTURNED. This session will be hosted on WildBluePress.com. Stay tuned for more details. If you enjoy Forensic Files, CSI shows and the very best in true crime stories, you’ll love NO STONE UNTURNED by Steve Jackson. An updated version of this true crime classic will be released for the first time as an eBook on April 28, with audio book soon to follow. The thrill-packed mystery sequel to THE DEADLINE by Ron Franscell will be released on May 15. THE OBITUARY is on pre-order now. Catch up on the adventures of Jefferson Morgan first by reading THE DEADLINE. Has one of Wisconsin’s most troubling murders finally been solved? WildBlue Press true-crime author and investigative journalist John Ferak has a new three-part special investigative series for Gannett Wisconsin Media. 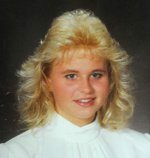 This series explores the Berit Beck murder case and will be published Sunday April 19th through Tuesday April 21st. John will host a live online chat at postcrescent.comTuesday April 21st at 11 a.m. Central where he will answers questions from readers about the case. Ferak’s stories will also be available in print at postcrescent.com. WildBlue Press Author Series on Shattered Lives Radio with Donna “Lady Justice” Gore. Saturdays at 5pm. Fifteen aspiring authors gathered in San Diego for the Beach House Writing Salon II to listen to WildBlue Press authors Caitlin Rother and Steve Jackson, as well as authors Chip Jacobs and Laurel Corona, discuss the process of writing and publishing with plenty of time to ask and answer questions. The salon was followed by a party complete with adult beverages, food and music provided by Breaking The Code (Caitlin sings in the band). WildBlue Press will be hosting similar and even bigger events in other parts of the country. Stay tuned for more information.